You’ve had your breakfast and your morning coffee / tea. A wedge of cheese and / or a fruit are not top contenders when you want to catch-up with an old friend, and especially when she has recently started her own line of natural baby products (folks, check-out Baby Mantra for Moms and Babies). This morning we decided to catch-up over a carrot zucchini muffin, and a brownie and a shortbread cookie at Dean & Deluca near the Rockefeller Center. 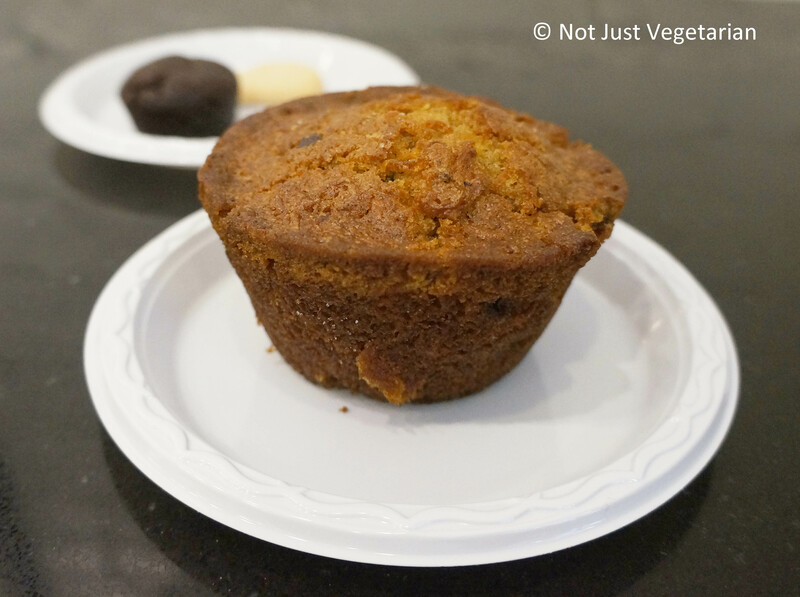 The carrot zucchini muffin was huge, to say the least. Well, it was the size of a regular muffin, but it looked huge to me. Am not sure what went into it (other than carrot, and zucchini) and whether it was vegan. It was delicious, with a perfect muffin top of a rough, dry exterior and crispy brown edges. The inside was a mix of many shades of orange (because of the shredded carrots), rust, brown, and flecks of green (from the zucchini skin) – kind of, like a glorious fall day. I could taste cinnamon, nutmeg, and a few plump golden raisins. The muffin was moist, not too sweet and not too crumbly. It kept begging us to eat more and more. I would definitely get this if I went back to Dean & Deluca again and if its available. Strangely, this muffin is not listed. A quick internet search, however, yields many recipes. See this one by Giada de Laurentiis from FoodNetwork, and this one by GimmeSomeOven. I have not tried making muffins from either recipe, but they both seem easy enough to bake quickly. Kyotofu is a restaurant / dessert bar that makes vegan, and gluten-free cookies and modern Japanese desserts with artisanal tofu. 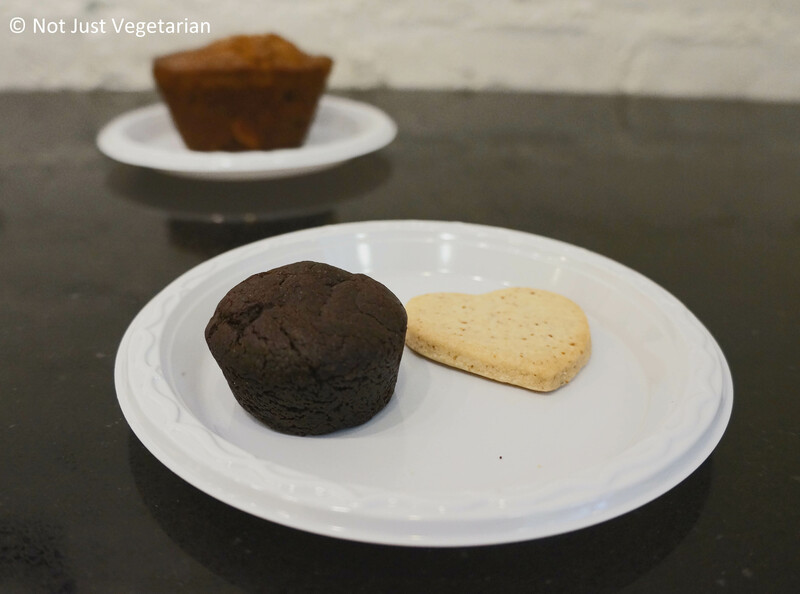 The vegan brownie and the vegan, gluten-free cookie were from made by Kyotofu and retailed at Dean & Deluca. The vegan brownie was bite sized and individually wrapped. My friend was not keen on a tofu / miso brownie, but she tasted it anyway and was not terribly impressed with it. The brownie was delicious when I took the first bite. The texture was perfect – neither cake-like nor fudge-like. I would have preferred a sweeter brownie – I could not tell if the slightly bitter taste was from the dark chocolate or the miso. For a brownie that is dairy-free and egg-free, this was fantastic. I must add, however, that the brownie tasted like a chocolate-flavored, protein energy bar. i.e., there was something in it that made me not want to have more than the two bites that I had. As you can tell, I am not a fan of protein energy bars even if they are chocolate flavored. I was not looking for a gluten-free cookie. I was keen to try a genmai toasted brown rice shortbread cookie, and if its gluten-free, so be it. This bite-sized, heart-shaped cookie had little red flecks on it (I know this sounds like the cookie got measles, but believe me, it was not gross!). It was thin, flat,and crisp. It had a nutty flavor just like toasted brown rice would have. It was mildly sweet, and was neither too soft nor to hard to bite. This cookie did taste like a shortbread cookie, although it did not feel as rich and filling. I would get it once again. Another gluten-free cookie that I would like to try is the black sesame shortbread cookie. Trivia: Did you know that there are people who are sensitive to gluten, but do not have Celiac disease, and that many of those who may or may not be sensitive to gluten, self-diagnose a gluten sensitivity and get on to a self-imposed gluten-free diet. So says this NY Times article says. As with anything involving self-diagnosis, it’s best to check with your physician before embarking on a gluten-free diet. These three items can make you believe that you are eating healthy, but it’s all a matter of portion size, whatever else you eat during the day, and how much you exercise, right? Also, if you were wondering, I love Baby Mantra’s calming body lotion with lavender oil. It certainly calmed my anxiety about the calories that I consumed this morning. Dean & Deluca mid-town is at 1 Rockefeller Plaza (48th St between 5th and 6th Ave). New York, NY 10020. There are many other locations of Dean & Deluca in NYC.